Battlefield 3 Executive Producer Patrick Bach says the upcoming shooter will "probably" use some kind of Online Pass system that will force preowned buyers to pay extra for multiplayer access. Gamers hate it but publishers love it and it's probably not going away anytime soon, so it's no surprise that the upcoming Battlefield 3 will most likely incorporate some form of Online Pass, the system of single-use codes that forces preowned buyers to spend a few bucks extra to get access to all of a game's features. The codes are typically tied into online components, which makes their inclusion with the multiplayer-focused Battlefield 3 a natural fit, yet Bach seemed a little reluctant to hitch his horse to that wagon. BF3 players will "probably" have to register a code included with the game in order to play online, he told GamerZines, "but I don't think it's an online pass, I think it's our own backend. I'm not sure I want to call our system an online pass." Bach acknowledged that EA will likely use the system to lock out preowned buyers unless they also purchase a standalone code for online access but insisted that it's nothing that hasn't been done before, saying that Battlefield games have "always had a code in the box in one way or another." "The whole idea is that we're paying for servers, and if you create a new account there is a big process on how that is being handled in the backend," he explained. "We would rather have you buy a new game than a used game because buying a used game is only a cost to us; we don't get a single dime from a used game, but we still need to create server space and everything for you." "We want people to at least pay us something to create this because we're paying for it. It was actually a loss for us to have new players," he continued. "Hopefully people understand why. It's not to punish people. To us it's compensation." Online Passes are nothing new, particularly for EA, but Activision's pledge to never charge for multiplayer access in the competing Modern Warfare series, combined with the general disdain for Online Passes in the first place, might be enough to turn it into a big bone of contention among gamers. Could this hurt EA's quest to make the Battlefield franchise a big dog in the modern combat shooter fight? 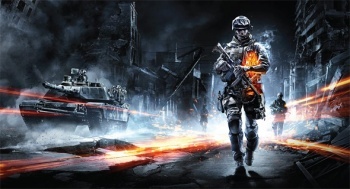 Battlefield 3 launches on October 25 for the PC, PlayStation 3 and Xbox 360; Modern Warfare 3 follows two weeks later, on November 8.